Kevin Byard paid his dues to Terrell Owens by shining brighter than the Dallas star. Joe Horn wasn’t the only former star receiver to receive a celebration tribute this week. 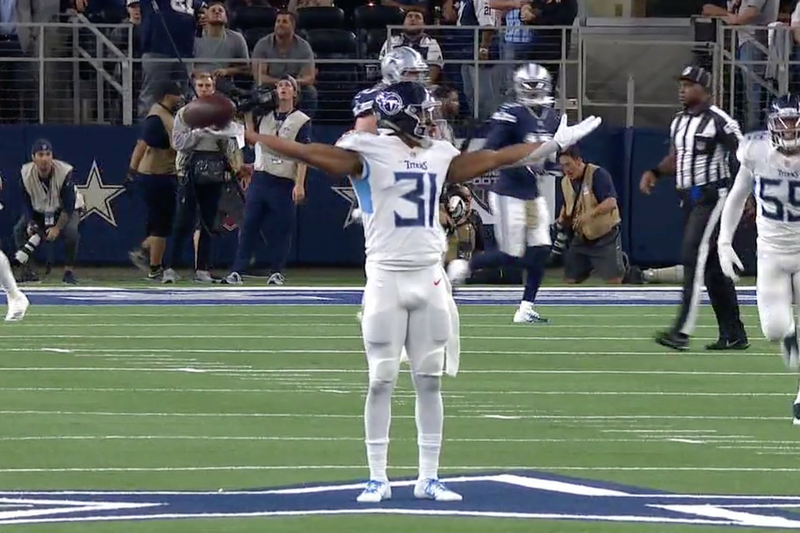 After intercepting Dak Prescott in the end zone, Titans safety Kevin Byard paid homage to Terrell Owens by running towards midfield and celebrating on the star in the middle of the field. Back in 2000, Terrell Owens ran to the midfield logo after scoring a touchdown when he was a member of the San Francisco 49ers. Like Owens’ celebration, a Cowboys player wasn’t particularly happy with the celebration on the star. Cowboys cornerback Byron Jones ran onto the field and pushed Byard and the rest of the Titans off of it. Terrell Owens noticed the celebration and gave Byard some recognition on Twitter. Maybe the Cowboys shouldn’t throw interceptions in the end zone if they don’t want players dancing on their logo.